A 74-year-old west Cumbrian man has died, and four family members are serious injured, after a collision between Cockermouth and Keswick. A jury in the trial of a truck driver accused of causing the death of a motorist by dangerous driving has retired to consider its verdict. A mile-long stretch of the A66 between Kirkby Thore and Low Moor, east of Penrith, is to close for seven weekends. The road will close at 10pm on Fridays and will re-open at 3am on Mondays. Engineers say the roads old foundations need to be completely rebuilt. Motorists will face diversions along the A69 to the north or the M62 to the south. The closure will start on 7 September. A driver has suffered minor injuries in a crash involving a tractor and a lorry on the A66. This is the third collision to have happened on this stretch of road at Kirkby Thore in one week. The road was closed for two hours between the Main Street junction and the B6542 junction in Appleby. Two men have been taken to hospital following a serious collision involving two lorries on the A66. Officers were called to the incident near to Kirkby Thore at around 9.30am. One driver, a man in his 50s, from Scotland, was taken to Carlisle's Cumberland Infirmary. Another driver, a man in his 40s, was flown to James Cook University Hospital in Middlesbrough. Police say the road is expected to be closed for five to six hours, in both directions, between Kemplay Bank and Brough. A man who died after being involved in a collision on the A66 has been named by police as 92-year-old Alec Bond, of Cockermouth. Mr Bond died on Friday 22 December at the Royal Victoria Infirmary in Newcastle, following the crash on Tuesday 19 December, where the he car driving collided with a lorry near to Threlkeld. The death has been referred to the HM Coroner for Newcastle. Anyone with information should call PC691 Ormerod on 101. A 92-year-old man from Cockermouth who was in a critical condition after being involved in a crash on the A66 has died. 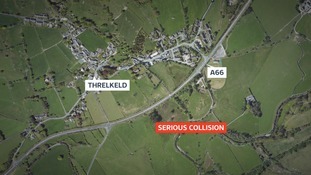 The car he was driving collided with a lorry near to Threlkeld at around 2.15pm on Tuesday. He was taken by the Great North Air Ambulance to the Royal Victoria Infirmary in Newcastle, where he died this morning. Anyone with information should contact PC691 Ormerod on 101. A 92-year-old man from Cockermouth is in a critical condition after being involved in a crash with a lorry on the A66 near Threlkeld yesterday afternoon. The driver of the lorry was a 46-year-old man from St Helens, who was uninjured. Police were called at 2.20pm and the road was closed until 8.30pm while emergency services dealt with the incident. The elderly man was taken to the Royal Victoria Infirmary in Newcastle. An update is expected be given on his condition this afternoon.